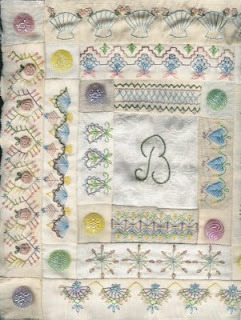 Valerie Bothell: Victorian Fancyworks Sampler Done! I have finally finished my Victorian Fancyworks Sampler! Well except for any additional embellishing that I want to do to my monogram in the middle. Whew..that pattern was challenging and it really helped me to practice more difficult stitch combinations. I did enjoy doing it though. What beautiful seam treatments! Great job. Oh Val only one word comes to mind and that's gorgeous!!! Great work. 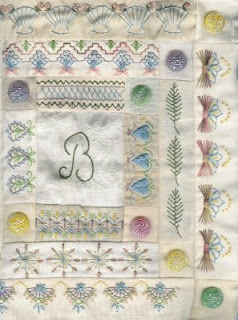 Val your block is just beautiful, what a wonderful verity of stitches. These are wonderful seam treatments. I loved them, gorgeous work, indeed.